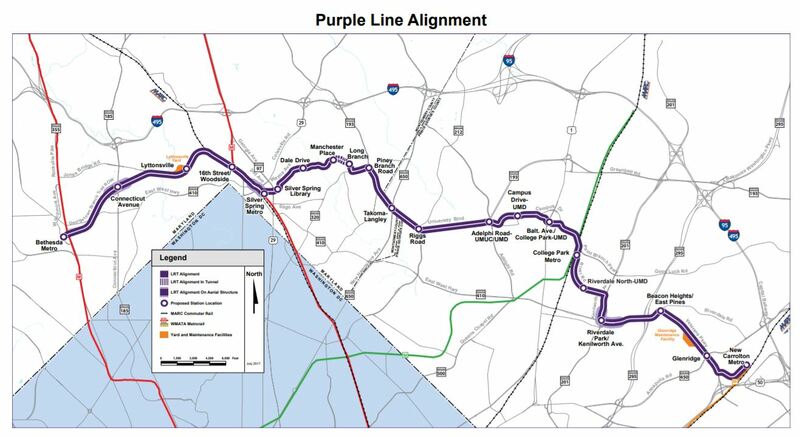 The Purple Line is a 16-mile light rail line that will extend from Bethesda in Montgomery County to New Carrollton in Prince George’s County. It will provide a direct connection to the Metrorail Red, Green and Orange Lines; at Bethesda, Silver Spring, College Park, and New Carrollton. The Purple Line will also connect to MARC, Amtrak, and local bus services. The Purple Line will be light rail and will operate mainly in dedicated or exclusive lanes, allowing for fast, reliable transit operations. Twenty-one stations are planned. Maryland Transit Authority is taking the lead on this project, with the support and close coordination of a team that includes the Washington Metropolitan Area Transit Authority, Montgomery and Prince George’s counties, the Maryland-National Capital Park and Planning Commission, State Highway Administration, and local municipalities in the project area. MTA has divided the 16-mile Purple Line corridor into eight areas, each to be represented by a Community Advisory Team (CAT). The MTA and Concessionaire have committed to maintaining open dialogue with the communities surrounding the Purple Line via CATs with the objective of building a long-term relationship through completion of the project. The CATs are member-driven teams with representatives appointed from neighborhood and civic associations adjacent to the alignment. There are also representatives from business associations and local governments. See Maryland Transit Authority information page, linked below. June 27, 2018 – Purple Line Presentation to Council. Purple Line Now presented its third forum in their Envisioning the Purple Line series with MD Secretary of Transportation Pete Rahn as guest speaker, along with a panel that includes Purple Line Transit Partners and representatives from Prince George’s and Montgomery counties.